I completed the weaving back on the 7th, but by then all enthusiasm for it was gone. The good: It survived the washing machine just fine. The thick texture feels lovely. The bad: Not loving all the colours in it. 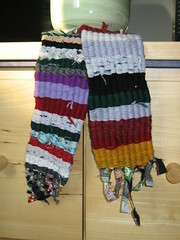 The sections made of crochet chains of thinner treads pinch in, probably a tension issue. I really don't know much about weaving. The biggest problem, and possibly the cause for the growing lack of enthusiasm, is that I have no idea at all what to do with it now. It will live with my other scraps indefinitely, and adding to my scrap pile isn't really what I want to do right now. After the weaving was done, I tried to start on another writing project but gave up. It seems that without an external deadline, I just couldn't keep writing. Discouraging. I'd like to write the story, but I felt like I was just wasting the time on the commute. But now, I've got a new project: mending my Make do and Mend bag. It had been my daily shopping/crafting/lunch bag for ages, but then the holes got too big. I've replace it with a bag that says Parsnips, but it's just not the same. So, inspired by a blackwork workshop at the guild, I've started reinforcing the less-ripped side with a strong cotton weaving yarn. Usually, I'd say embroidery on the bus is a literally bloody mess. But the bag is a loose weave hessian with plastic backing, easy to use a nice round tipped needle with. Plus, the blackwork pattern is easy to follow, and feels like meditation when it is going smoothly. Anyway, I'm not worried if it ends up a bit wonky. The plan is to do some free-style darning stitch on the more ripped side, and reinforce the bottom of the bag with some denim. Not sure if it's the change of the seasons, or just getting over a bad mood, but I feel like the mending project is making me happy.